To say all martial arts films are alike, is like saying every potato chip is the same. Sure there’s a base formula, but the good ones add to that recipe to make each film stand out on their own. Take the following films into consideration: ‘Seven Samurai‘, ‘Enter The Dragon‘, ‘IP Man‘, ‘The Karate Kid‘, ‘Kill Bill Vol. 1 & 2‘, ‘13 Assassins‘ and any Van Damme movie you want, they are all martial arts films, but they have an entirely unique identity. I grew up on old martial arts films with horrendous English dubbing and every action star there ever was. I developed a deep appreciation for and love of all things Eastern that has carried through my adult life. 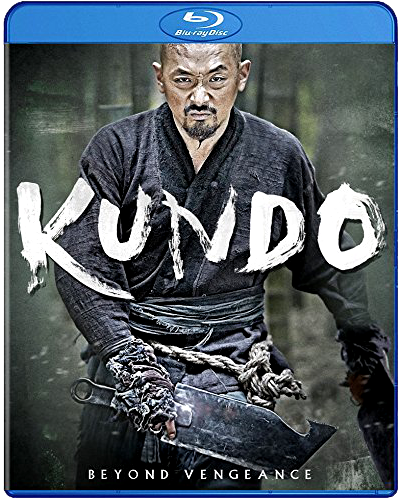 I was excited to see ‘Kundo‘ and have, in fact, watched it three times. 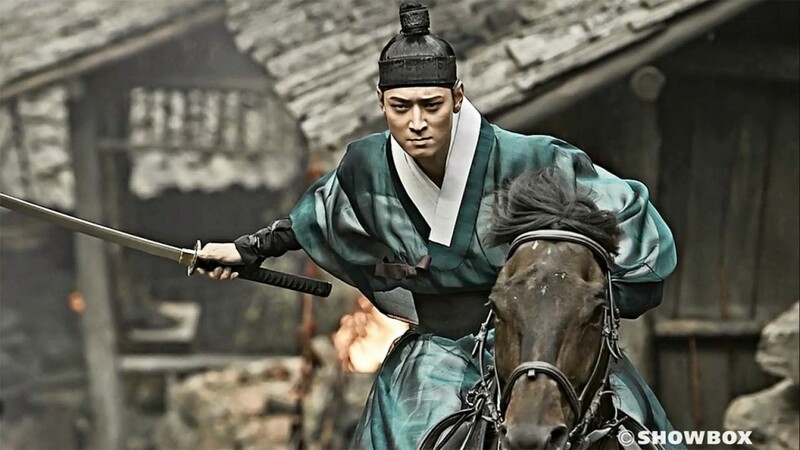 ‘Kundo‘ is a 2014 South Korean period action film that takes the Robin Hood legend and crosses it with ‘The Magnificent Seven‘ with a dash of comedy sprinkled in. I was expecting a run-of-the-mill martial arts flick and I can safely say that this did not fit into that category. In the late Joseon dynasty, when status was decided by birth, Dolmuchi was a poor butcher who saw how the aristocracy treated it’s lowest classed citizens and learned first hand that poverty ran hand in hand with hunger and ultimately death. His oppressor, Jo Yoon, is part of a very powerful and wealthy family, but is illegitimate and will not attain the level of power he craves, so he devises a plan to take it. Jo Yoon expects Dolmuchi to murder for him and when he can’t, his mother and sister pay the ultimate price. This creates a vengeance that burns in Dolmuchi with a burning intensity, he is then recruited by the Kundo who have made robbing from the rich, feeding the poor and righting wrongs a way of life. Reborn as Dolchi, he channels his rage into becoming a fierce warrior with a reputation that haunts those in power. Jo Yoon’s power continues to grow and Dolchi waits for the day he can finally exact his vengeance. I was hooked from the moment I heard the music. 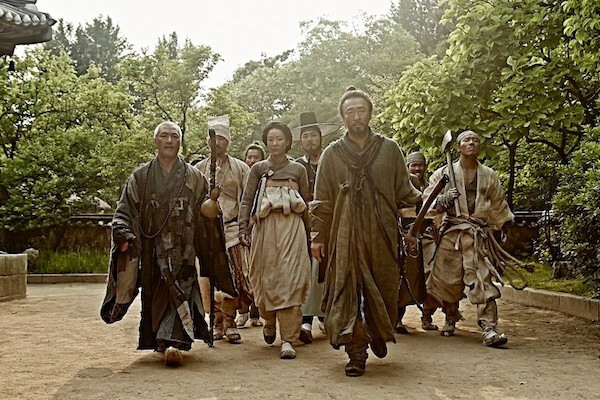 To say this was a Korean martial arts film crossed with a spaghetti-western sounded odd to me, but it worked perfectly! The music had an Eastern vibe but still had the tell-tale resonation of any Kurosawa movie. Action sequences kicked off the film and didn’t really let up throughout its entirety. In any film you have to have a little bit of a suspended belief system in play, especially action movies, but this was particularly true when Ma-hyang pulled a stunt reminiscent of Legolas in any of the ‘Lord of the Rings‘ films with a bow. The cast was fantastic and I couldn’t imagine finding a better fit for the principals, anywhere. Jung-woo Ha (‘The Chaser‘) played Dolmuchi with perfection. He was more than a great martial artist that looked good on screen, he had a great comedic presence and his face was more expressive than I’m used to seeing. Dong-won Kang (‘Woochi‘) was incredible as the villainous Jo Yoon. He kept a placid calm that was the polar opposite of Dolmuchi’s animation. He embodied the perfect bad guy you just love to hate. He cut a menacing figure when he pulled a sword and went to work, the fight scenes were truly beautifully choreographed. Where Jo Yoon worked with a blade that seemed as thin and long as he was, Dolmuchi paid homage to his beginnings as a butcher by brandishing two oversized cleavers. I was, as I always am, incredibly impressed and awed by the skills shown in the fight sequences. The final fight resembled footage from Black Friday sales where here the prize is freedom vs. a cheap 50 inch TV. Presented in Enhanced Widescreen 16:9 with 138 minute run time from Well Go USA Entertainment and Showbox. The color quality overall is uniform and appears quite natural with a light wash of either green or blue that is so incredibly light that it doesn’t detract from the experience but gives it a little bit of depth. The close-ups, which are quick and frequent, have no distortion issues and appear just as clear as a shot from a few hundred yards out. All color gradients appear as smooth transitions with no distortion. This release comes with a lossless DTS-HD 5.1 audio mix in Korean with English subtitles. The audio quality was just as superb as the visual aspects. The overall production was incredibly well-balanced with dialogue, the score and action sequences equal, and thanks to a great sub-woofer, I could really feel the horses running which made the home theater viewing experience just beautiful. There were no instances of any pops, cracks or hissing to speak of. This film has become one film that I will gladly recommend repeatedly. It was an easy watch, no effort involved outside of reading subtitles. ‘Kundo‘ has taken place in my top 5 favorite martial arts films and I can see it ranking higher the more I watch it. Overall, it is a great film that should be added to your film library. I decided before 1/4 of the film was over that it was a 5 star film and watching the rest of it did not change my mind. ‘The Doctor and the Devils’ Blu-Ray Review!!! This entry was posted on Thursday, January 8th, 2015 at 11:17 pm	and is filed under Film, News. You can follow any responses to this entry through the RSS 2.0 feed. You can skip to the end and leave a response. Pinging is currently not allowed. « A Bunch of Horror Veterans Have Joined ‘Tales of Halloween’! !